The road from “content” to put-my-head-in-the-gas-oven? I can’t think about this for more than a minute. When I do, I myself get consumed. Sylvia Plath is usually off limits for me. As caught up in life as I get sometimes, so I get caught up in death. So I stay away. On purpose. I first heard about Plath from my friend S., who was always much deeper and much more mature than any of my childhood friends, and who was reading her mother’s copy of The Bell Jar already in eighth or ninth grade. When I saw the book on her bed one day, S. told me of Plath’s depression and her rocky relationship without much fanfare. But I couldn’t get the image out of my head — the 1950s era housewife with her head in a 1950s era gas oven. Perhaps because of how impressionable I was when I first heard about Plath, the image has been ingrained in my head ever since and so I’ve never read Plath. Yesterday, however, attracted by a well-crafted tweet, I clicked on to Brainpickings.org and found myself faced with Sylvia Plath. 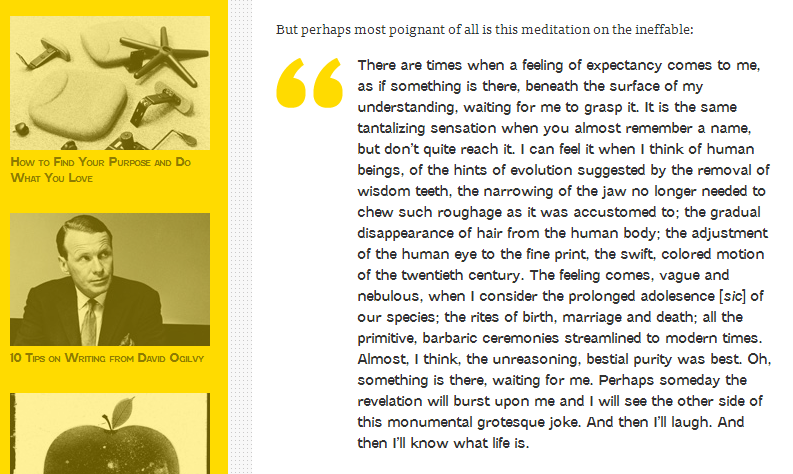 I almost didn’t read the article, but I love BrainPickings so. In a post commemorating the 50th anniversary of Plath’s suicide, Maria Popova pulls out entries from Plath’s journals that I can relate to. Entries, as Popova writes, that give us “a record of [Plath’s] incessant oscillation between hope and hopelessness;” Plath’s own “conflicted relationship with life and death;” and Plath’s apparent joy of life and her deep, thoughtful examination of the human species and her own humanity. The excerpts from Plath’s journals are exquisite and extraordinary. And something I want to read more of. But in order to do so, I need let go of my fear of Sylvia Plath. I need to let go of the unknown. Of what I don’t understand. I need to let go of the choices others make — the actions I have no control over or the reactions I can’t relate to. You understand why the answer must be, “Yes,” don’t you? Why letting go of Sylvia Plath is good for me. Oh my, I love Sylvia Plath! I know what you mean though, it’s sometimes very hard to separate an artist and their life from their (often tragic) death….it’s like the elephant in the room while you’re trying to enjoy/experience their work: “This poem is incredible…oh but she put her head in the oven 2 years later…” I find that for some reason, I can more easily view an artist as a complete package when I watch either a documentary or the Hollywood-version (if it’s done well) movie of their life. The Sylvia Plath movie with Gwyneth Paltrow was surprisingly good, I thought, and definitely fleshed out Plath a lot more for me. Also, I nominated I Made Aliyah for a Liebster blog award. I know you technically have more followers than the “rules” call for, but I wanted to spread the blog-love nonetheless! Check out my blog for more details. I have the same feeling about Plath. She was a supremely gifted and sensitive human being who wrote with a talent and spirit which many of us aspire to but look what she did to herself. The price of being sensitive and aware is greater than most of us are willing to pay I suspect, at least to that level.